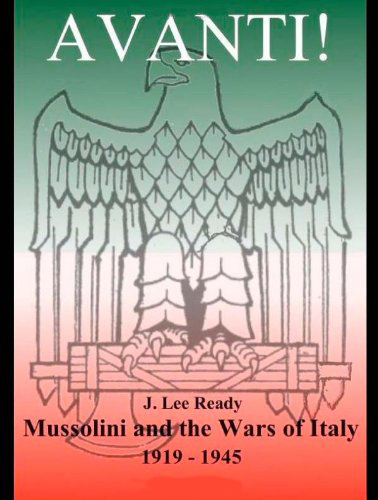 From the Street War 1919-22, the Libyan War 1919-31, the Ethiopian War 1935-40, the Spanish Civil War 1936-39 and World War II itself, Mussolini was the most popular and vilified Italian leader in centuries. Internationally acclaimed historian J. Lee Ready has produced another monumental work. Avanti: Mussolini and the Wars of Italy. This book covers the Street War 1919-22, the Libyan War 1919-31, the Ethiopian War 1935-40, the Spanish Civil War 1936-39 and World War II. The book states opinions backed up by the author’s forty years of research and study. Mussolini was not executed by partisans, but was killed trying to escape. Italy emerged victorious in World War II. Italian troops were praised for their bravery on all fronts. Italian arms were highly efficient at times. Mussolini was the most popular leader in Italy in centuries, and also the most vilified. Italians were guilty of major war crimes, but were never punished by the Allies. Controversial and opinionative as all good histories should be, this book, Avanti, should be considered a standard work in Italian history and the story of World War II.